Among the 150 companies of different sectors, 80 cement plants applied for the award and 32 amongst them were selected for final day presentation between 22 - 24 August 2016 at HICC, Hyderabad. Shortlisted companies presented their steps taken toward achieving energy efficiency and was duly evaluated by panel members of CII. 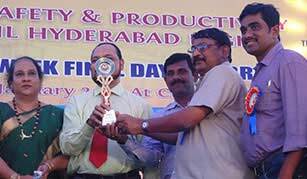 8 Cement plants awarded with "Excellent Energy Efficient units"
24 Cement plants awarded with "Energy Efficient Units"
Kadapa Plant of Bharathi Cement has bagged the award under "Energy Efficient Unit". On 30 th Aug'16 at World Trade Center Mumbai, Live week Business media has launched its 6 th edition of 'CSR Good Book', a compilation of CSR activities done by socially responsible corporates and organizations. A two day annual conference was held to deliberate on latest developments and future opportunities in CSR & Sustainability on a theme "CSR FOR SOCIAL GOOD AND ITS IMPACT". More than 45 corporation's which include public sector enterprises and organizations are profiled in 2016 edition, some of them include Aditya Birla group, Piramal Foundation, Maruti Suzuki, DLF Foundation, Reliance ADAG Group, CRISIL Foundation, Sandvik India, GATI etc. Vicat in India has also contributed a two page CSR update in CSR Good Book on the several projects undertaken across villages in the two cement plants. Anoop Kumar Saxena, COO (Vicat in India) was one of the elected members for panel discussion on " "The Central Government' Social Mission Swachh Bharat Mission and Impactful Interventions by PSU's, Corporations and Foundations". He got an opportunity to showcase our contribution under CSR especially our flagship project "Swachh Bharatiya" which is aligned to Government of India’s Swachh Bharat with an objective to promote construction and usage of individual toilets. He made a point that creating facilities won't be enough, more efforts to be taken for educating people and bringing behavioral change in society towards health and sanitation. Some of our actions on that line are well appreciated. 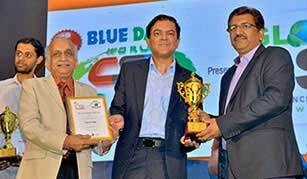 Bharathi Cement, Kadapa Plant was awarded the prestigious “Best Sustainable Practice” under Global Green Award category held by World CSR congress on 18th Feb’16. 75 countries and 35 business sectors competed. 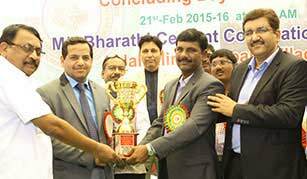 2 cement companies from India were awarded and Bharathi Cement is one of them. Bharathi Cement was awarded for its sustainable use MSW (Municipal Sewage Waste) under RDF category (Refused Derived Fuel), which helps in disposal of the waste and ensuring clean environment. 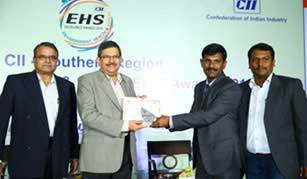 The Confederation of Indian Industry (CII) Southern Region awards the “Excellence Award in Environment, Health & Safety (EHS)” for the Companies who excel in EHS practices and implement them effectively. Bharathi Cement was awarded a few times under Mines Safety Week celebrations organized every year by Mines Safety & Productivity Council, under Dy. 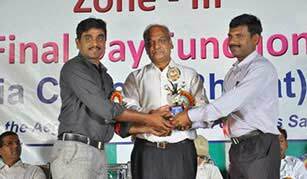 DGMS, South Central Zone, Hyderabad office jurisdiction. The council's audit teams after inspection of all the mines adjudges the best mine on various parameters like Mine Workings, Drilling & Blasting, Environment, Electrical Installations etc. The Indian Bureau of Mines (IBM) organises Mines Environment & Mineral Conservation (MEMC) Week Celebrations under their office jurisdictions. We come under the office of Regional Controller of Mines, IBM, Hyderabad. 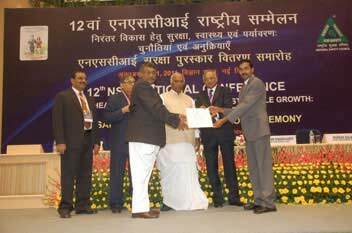 We were awarded the prestigious Prashansa Patra by the National Safety Council by the Ministry of Labour, Government of India on 19 October 2011 by Mallikarjun Kharge - Honorable Minister of Labour & Employment, Government of India and Venu Srinivasan- Chairman National Safety Council India at Vignan Bhavan New Delhi. The award was given for our Line 2 construction activities executing the ‘Building and Construction Work’ as defined under Building and Other Construction Workers (BOCW) Act. More than 100 building workers working on the project for at least 240 days with no LTI cases.